Akit's Complaint Department: People Like TransLink (Clipper) on BART - How about Muni? People Like TransLink (Clipper) on BART - How about Muni? Not long ago, the SF Examiner published a brief article stating in a recent survey of BART passengers holding a TransLink card, 88% are satisfied with the card, an improvement of 6% when it was 82% a year ago. As for recommending the card to someone else, the results show 93% would, while last year was 89%. But problems are still quite high with 28% stating they had some type of problem; while down from last year (33%). One of the issues is the does not explain what the problem is with the program, so if they experienced even a minor problem (even if it's the user's fault) or a problem outside of the BART agency, it would still count as a problem. The BART Board of Directors will hear about the survey results in their meeting this Thursday. It's a good sign that people are taking TransLink/Clipper more seriously, and BART's cooperation in the program is much better than the days when they screwed the MTC over with their EZ Rider card and James Fang on a tirade about cell phones to pay for BART rides (and wasting $350K of our tax money). 28% experiencing a problem is still too high for this program. If I was surveyed, I'd have to agree that I've had some problems where the gates would reject the card and not open, and there's about a 5 second delay until I can try again on the same gate. If we were to compare BART's survey results to other transit agencies, I would think Muni would be on the bottom. Just within the last few days, I've already noticed the card readers on vehicles having problems. I'm curious to know how many did the survey and if it was available to all participants, or a restricted few who voluntarily transitioned from EZ Rider to TransLink/Clipper. Lastly, if things are improving and Clipper becomes popular, will BART ever consider converting some of their gates at the busiest stations to the electronic card only to help make a speedy exit? My experience was terrible. I got a pass because Walgreens was only carrying the t-link cards. Then a few days later it stopped working. Then after waiting through the Thanksgiving weekend to talk to someone at T-Link I had to send the pass back, while I paid for bus rides. Then I didn't get a pass mailed. Then when I finally got one, they would only compensate for $10 for 12 days that I did not have a functioning pass. I can't believe I am going to be forced to use one again. Any, by the way, don't put one near a mobile phone. just an FYI on putting the T-Card or Clipper card next to the phone, it does not mess with the card in any way shape or form. The cards dont get de-magnetized. 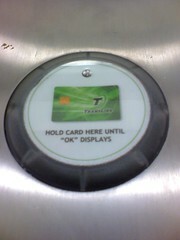 that is one of the reason they choose these cards to avoid issues like the bart tickets which have magnet strips.